IRELAND IS PLANNING to introduce sustainable-energy buses to public transport fleets by next year, in an effort to reduce our carbon emissions to avoid EU fines. The National Transport Authority (NTA) will tomorrow announce plans to roll out sustainable energy buses to state subsidised fleets such as Dublin Bus, Bus Éireann and school buses. This will be part of a range of announcements including a complete redesign of the network; a cashless payment system; new bus branding and bus stops, according to Minister for Transport Shane Ross. It’s yet unknown whether the buses will be electric, hybrid, or bio-gas buses, but all solutions are being considered by the NTA. It’s understood that a ‘quota’ system won’t need to be implemented, and there are no plans to bring in sustainable energy buses to private operators yet. A spokesperson for Bus Éireann said they are ‘working closely’ with the Department of Transport and the NTA on all future sustainable energy fleet plans. 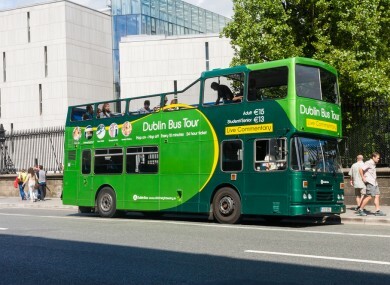 The NTA reportedly refused a previous application by Dublin Bus to trial hybrid buses in 2016 due to a lack of funding. But with gigantic fees looming over Ireland if they fail to meet the EU’s sustainable energy targets, the government hasn’t much time to lose. Norway’s capital city, the first with a zero-emissions transport system, is the sustainable-energy model most countries aspire to. Oslo’s metro, trams and buses run largely on hydro-electricity, and Norway has the highest percentage of electric cars of any nation. Despite being ahead of the game in relation to climate change measures, further plans are underway to restrict cars to its city centre. One in four new cars sold in Norway are electric and is likely to achieve its zero-emissions target by 2025. Ireland, meanwhile, could be given a bill of up to €75 million each year if it doesn’t meet its EU renewable-energy targets by 2020. Even though the NTA is working on introducing sustainable energy transport fleets by 2018, and falls under the remit of the Department of Transport, the Minister for Climate Change has come under criticism for a lack of responsibility and involvement in this plan. Denis Naughten is heading up the Department for Communications, Climate Action and Environment, but the Minister says he has ‘no official responsibility to Dáil Éireann’ for introducing sustainable energy buses to local authority transport fleets. Sinn Féin’s Peadar Toibin says that Ireland is unique in the EU in failing to reduce their carbon stamp, and that Naughton has “failed to make any real effort to decarbonising the economy”. “It’s logical that at this stage, the government would be developing targets with regards introducing electric, hybrid and bio-gas vehicles in this sector. The responsibility for introducing green-carbon buses lies with the Department of Transport – but they didn’t leave Naughten out in their statement to TheJournal.ie. “Matters relating to air quality and greenhouse gas emissions are primarily the responsibility of Minister Denis Naughten and the Department of Communications, Climate Action and Environment. The department said that a full plan on how to meet emissions targets will be published by the summer. Email “By 2018, transport fleets like Bus Éireann will have green energy buses”. Feedback on “By 2018, transport fleets like Bus Éireann will have green energy buses”.